I am often asked, “What should I feed my puppy? What do you recommend?” I have always researched the dog food and looked at the first few ingredients, as I was told that these were the most important and meat should always be the first one. The guaranteed analysis was the next important criteria. 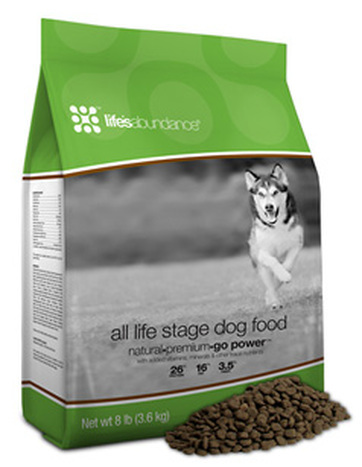 We had been feeding Kirkland Dog Food but then we were introduced to Life’s Abundance Dog Food. We were so impressed by the quality and high standards of this dog food and the amazing testimonials from the customers and field representatives of this company that we decided to switch to Life’s Abundance Nutritional System and Agility Formula. Our mission at Oregon Premium Labradors is to improve the quality of the Labrador Retriever Breed and offer our customers beautiful, healthy, and sweet-tempered puppies that they can enjoy for years to come. Needless to say, I was pretty impressed. I learned that pet food was developed around World War II. It consisted of left-over grains that were rejected for human consumption. It was recognized very quickly that grains alone were not providing adequate nutrition, so protein was added. Now, however, the protein source became meat rejected meat for human consumption; dead, diseased, dying, disabled, or drugged animals met the criteria. By-products such as chicken heads, duck bills, fish heads, chicken and turkey feet, bones and diseased & contaminated slaughterhouse meat can also be included in today's pet foods! BHA, BHT, which harm our dogs' livers and kidneys and are known carcinogens. Ethoxyquin, which is used to stabilize rubber can also be used. All these chemicals are added to provide a longer shelf life (for months, even possibly a couple of years. We are now feedings our dogs Life’s Abundance Nutritional System and Agility Formula and raising the puppies on this food supplements to ensure a long and healthy life, as well as provide our puppies a healthy start. While this dog food “seems” more expensive up front, the cost is about $1.88 a day for a 70 pound adult dog. Americans spend more than that on their Starbuck's coffee every morning!!! You feed less dog food, but they receive more nutrition! They are able to digest and utilize the dog food more. And you are ensuring a long and healthy life for your pet when you feed them quality nutrition! Isn't your precious puppy worth it?